My first picture post of the year should be epic right? 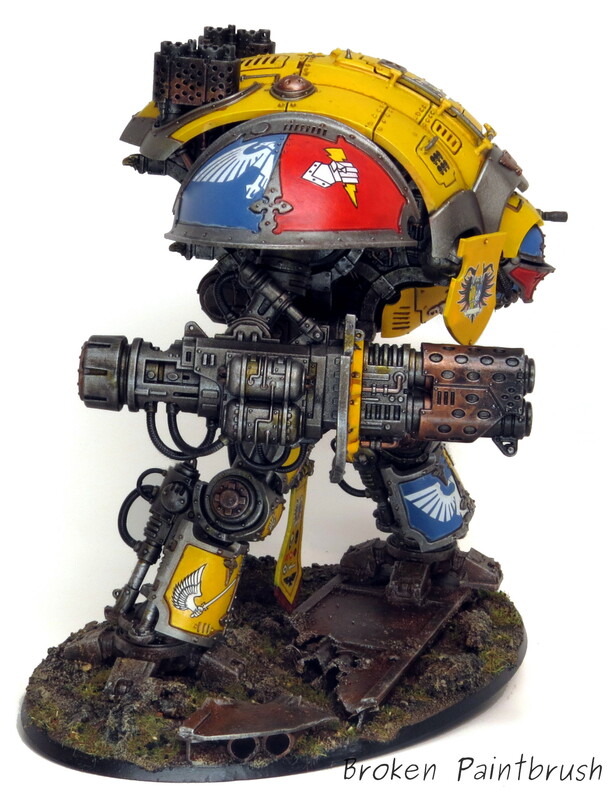 Well here is my first Imperial Knight Titan for my yet unnamed house. 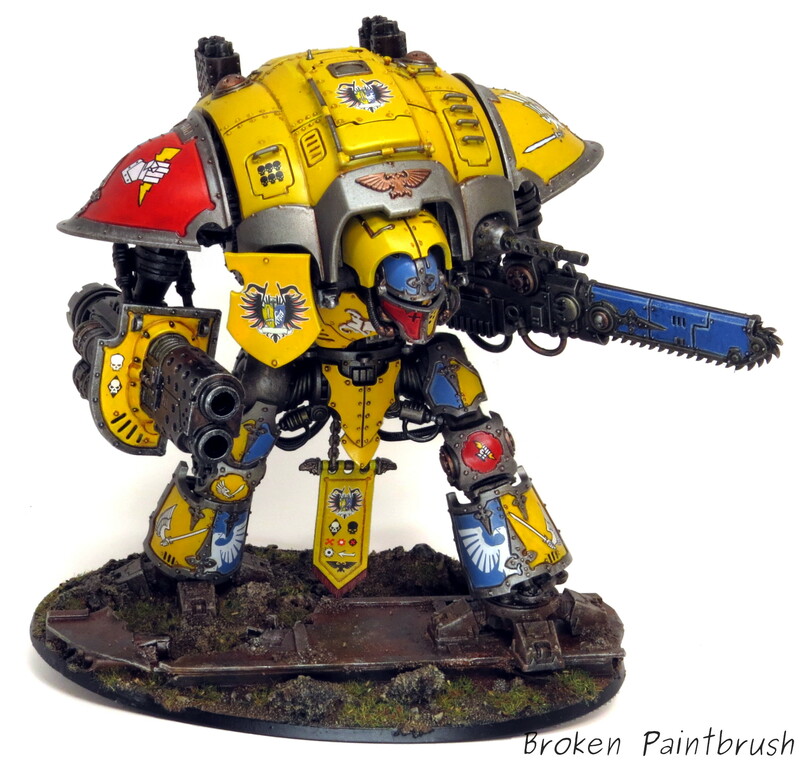 My wonderful wife bought me this Knight Titan [get it at Amazon] last Father’s Day and it has been a slow process to build and paint this beast. In the end, I can’t get over how amazing this model is in person – any one that has finished one knows what I am talking about I’m sure. I decided to create my own, as yet unnamed house, and since my wife’s favorite color is yellow, it was only fitting that it would be the primary color. The amour plates were left separate and I glued them to penny nails to act as handles to paint and I could stab them into corks to dry. The main colors were all done using an airbrush and my meager skills allowed for very little highlighting – but a good dose of painters tape allowed the pauldrons to be painted both colors. 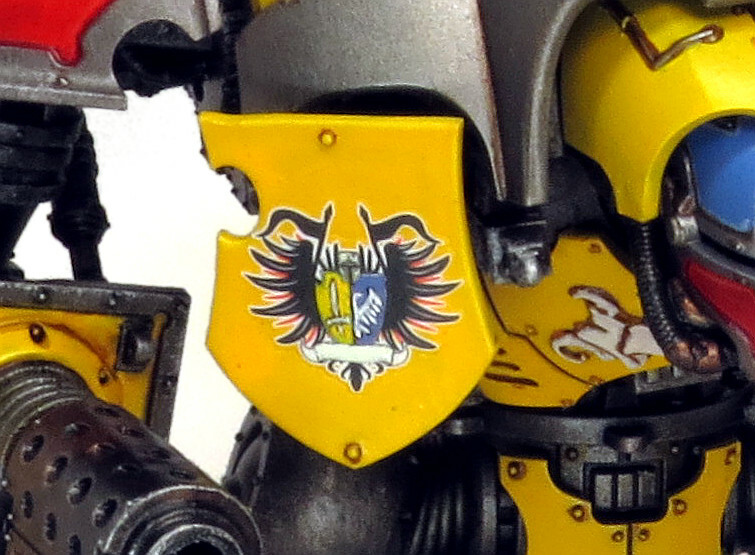 The family crest of the winged sword was taken from the Baneblade transfer sheet that fits the shin guards perfectly. 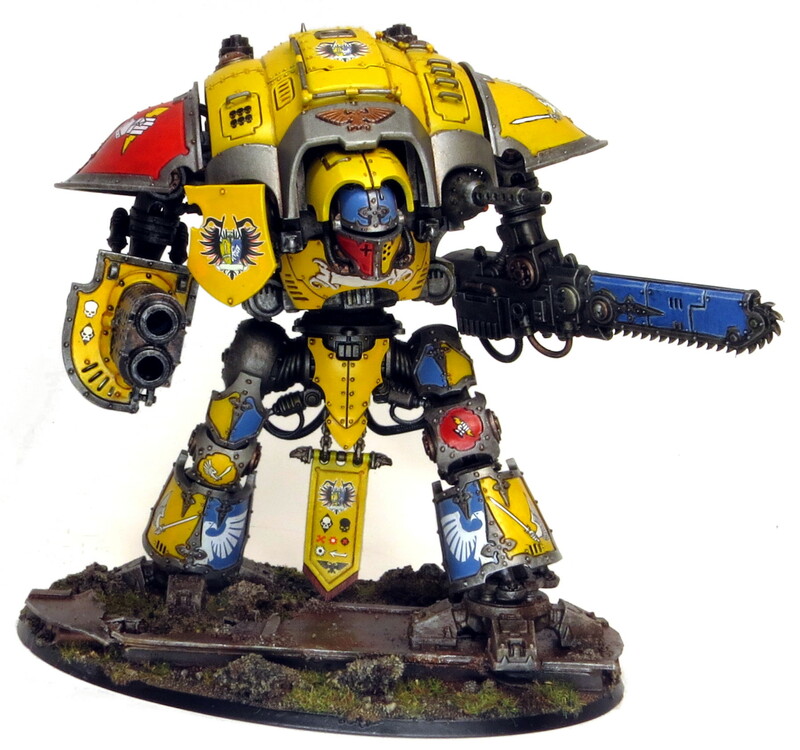 The version for the knee was from the Space Marine sheet and the large version for the shoulder was a combination of the wings from Hawkshroud, the sword from Cadmus and the fist from the Chaos Space Marine sheet. I will be posting how I went about this shortly. Check out how I made my custom decals. The full house emblem was also taken from Cadmus. 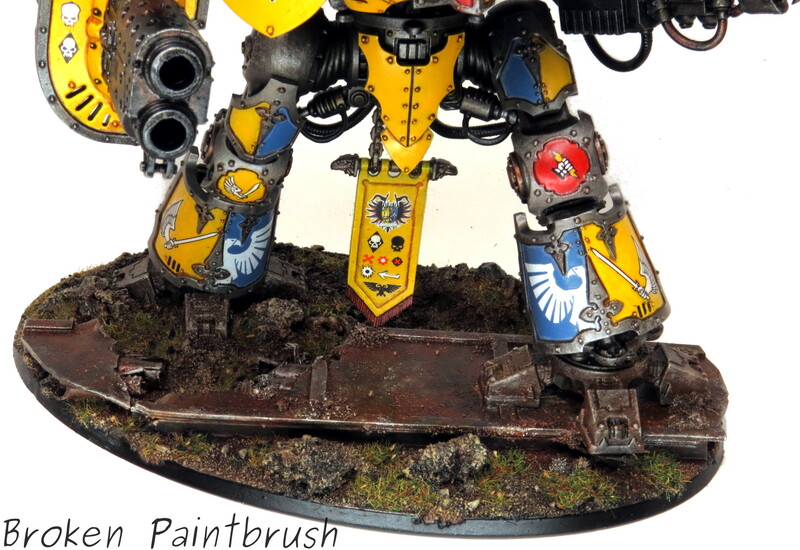 I painted over both halves while leaving the half-aquila in place. I couldn’t get the full winged sword to fit, so I left it as just the sword. 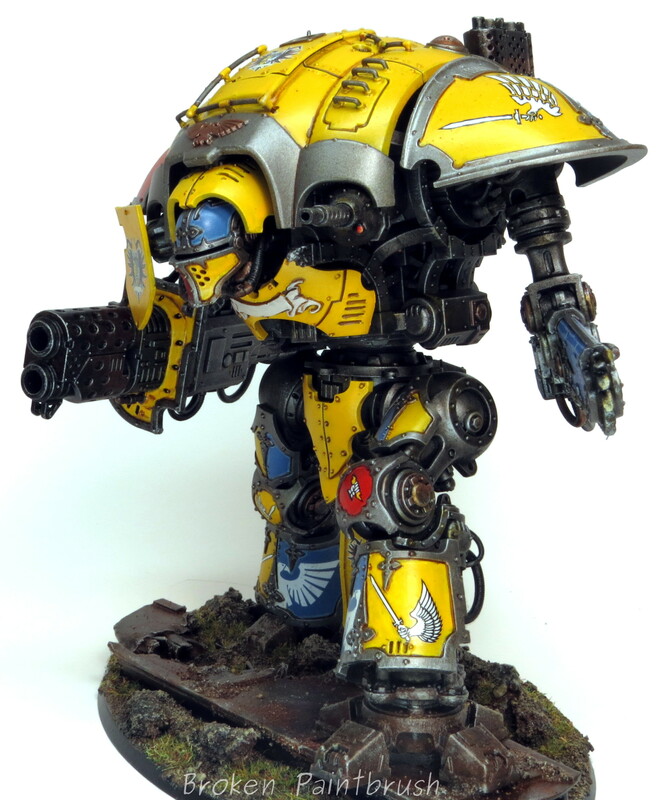 The half-aquila was then painted white to match the shoulders. 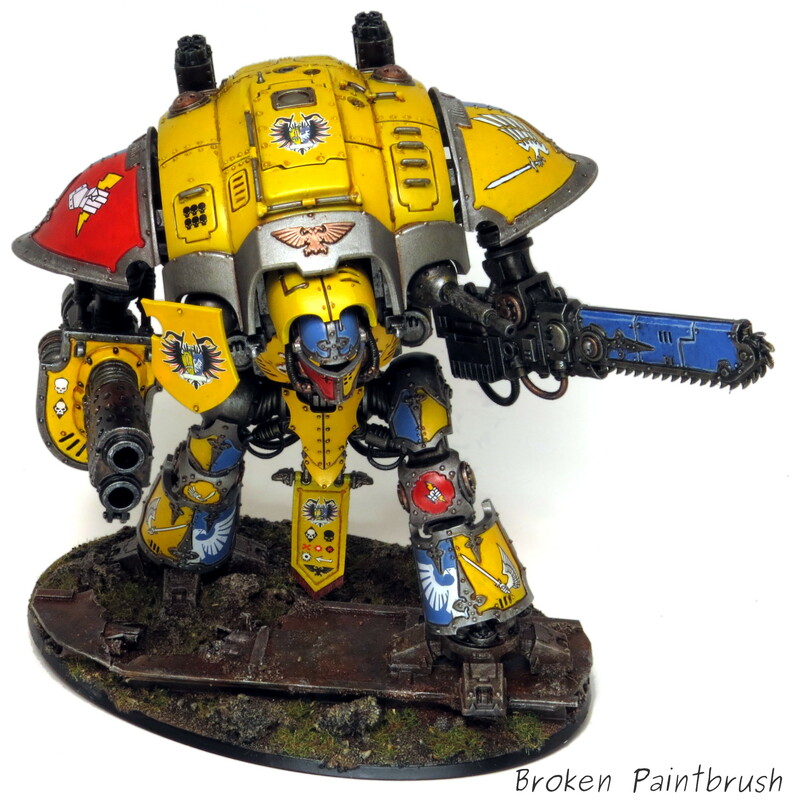 His personal icon of the fist and lightning was also taken from the Baneblade kit and smaller versions from the Imperial Guard Tank sheets (I have lots of decal sheets!). The original lightning was red, which didn’t go well with the red field, so this was painted over with the yellow. Unseen in these pictures is the LEDs placed in the meltacannon and the face mask as they are not yet wired up. The top plate is left unglued to allow access to the main center chamber and the arm LEDs are wired through his arm. The face hasn’t been wired yet as I need to get smaller wire to allow all four LEDs to be wired in (1mm LEDs are tiny!). The LEDs were inspired in part by this guy at The Dice Abide, though I’m still waiting to see his finished work. Since I had left the plates off the main body and glued to nails, I never had a chance to see the full model put together until the end. 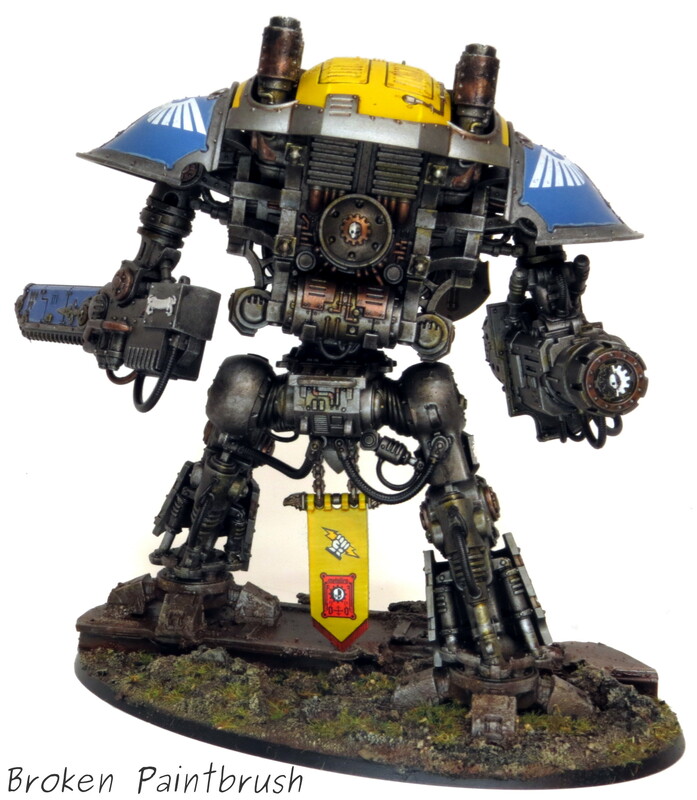 It is a very impressive kit that combines the arcane look of a knight, with the ridiculous mechanics of 40k. At this point I am still trying to figure out a name for the house and this knight which is why all the scrolls are left blank and unfinished. Any suggestions? For the base I used sheets of plastic and I-beams to create an old, worn walkway that has seen a bit of war. The rust and mud were done using weathering powders in multiple layers, sprayed with clear coat, and high lighted with silver. I really enjoyed building and painting such a bit and complicated model, and while I still think the Reaper Chainsword arm is a bit stubby (check out the Forgeworld’s Castigator for a MUCH better weapon arm), the overall look is still amazing. 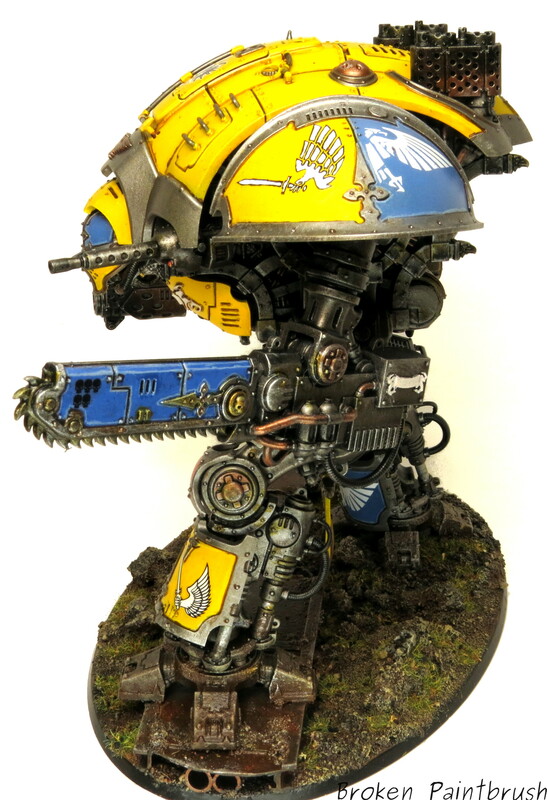 While it took me nearly a year to finish this model, I still have plans on adding at least two more to run as a full army with the Magaera a highly possible addition because it looks so cool.